Are you aware that 1 out of 6 of your employees is a caregiver, someone who’s job responsibilities also include taking care of a family member? This adds up to 2 full-time jobs at one time, and the employer is likely to be the also-ran. Caregivers keep a low profile at work for obvious reasons. One remarked: “My supervisor and I have a “Don’t Ask, Don’t Tell” relationship. When I come late or leave early, he doesn’t ask and I don’t tell.” Supervisors are likely to be sympathetic – they understand the conflict the caregiver is managing. But caregivers are forced into absenteeism, “presenteeism,” and errors stemming from divided attention. A 2010 survey by MetLife calculates that the average caregiver costs his employer about $2,400 a year in lost productivity. If you have 1,000 employees, 1 in 6, or 166 are caregivers. The cost of Caregiving to your company is almost $400,000 a year! 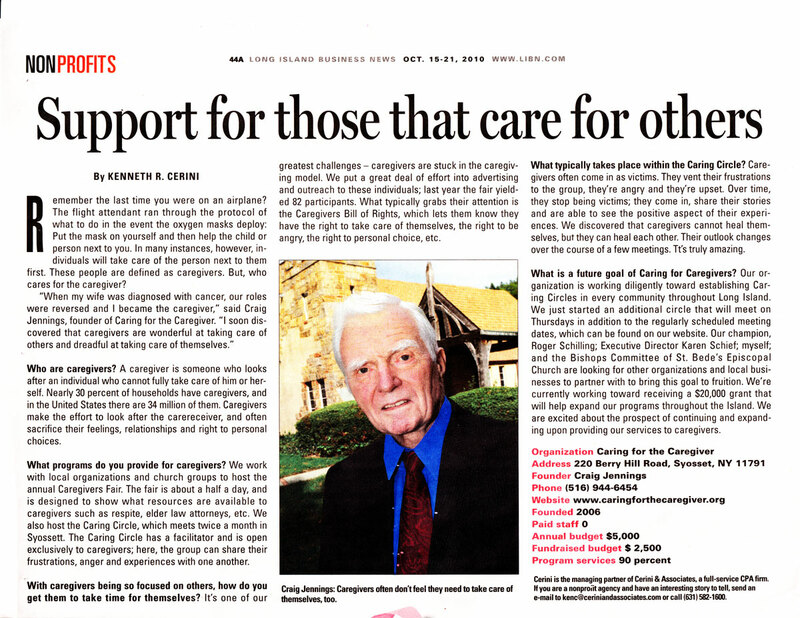 Caring for the Caregiver is a not-for-profit Long Island company based in Syosset that has come up with a program for Long Island companies. It is called “Empowering the Caregiver” and it couples two events: A Caregivers’ Fair and follow-up individual or group coaching sessions. This program has been proven very effective at empowering caregivers – getting them to shed and/or delegate a large part of their caregiving responsibilities. The net effect of this empowerment is that the caregiver has a better life, and is also able to devote more time and energy to his/her job. To explore these possibilities, this program, or any other related questions, including help for a particular caregiver, please call Craig Jennings at Caring for the Caregiver – 516 944-6454. The Church hopes to expand support group throughout Long Island….